A live specimen of “scaly-foot” gastropod from a hydrothermal vent at the Central Indian Ridge. Image modified from fig. 5B in Nakamura et al. (2012); CC BY 4.0 license (https://creativecommons.org/licenses/by/4.0/). Neomphalina are a fairly obscure group of gastropods, though one has achieved some recent fame. It was discovered in 2001 at a deep-sea hydrothermal vent system and has been named Crysomallon squamiferum. 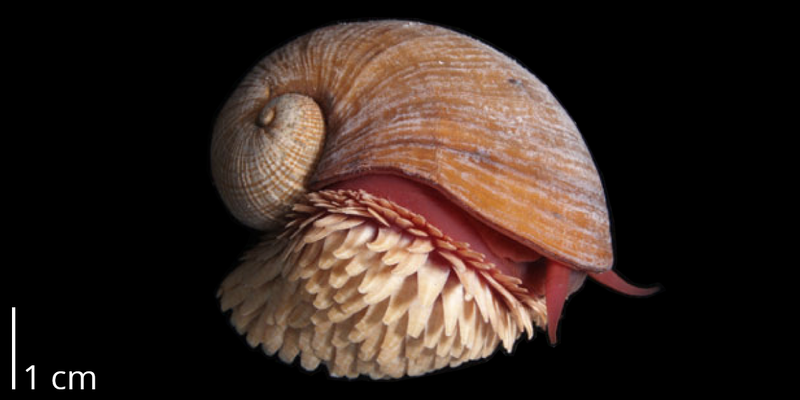 This snail has received considerable media attention (e.g., here and here) because it sometimes uses metal (iron sulphide, or fool’s gold) to construct both the outermost layer of its shell and protrusions extending from its foot. No other snail, or animal, is known to utilize metal in this way. As with the Cocculiniformia, the phylogenetic relationship of Neomphalina to the other major clades of Gastropoda remains uncertain. Bouchet (2011) presents the following families and genera as members of the Neomphalina . This list was copied from the World Register of Marine Species (WoRMs) on March 3, 2017 and is reposted here in concordance with the source material’s Creative Commons BY 4.0 license. The link associated with each name will direct you to additional information about that taxon on WoRMS. Bouchet, P. 2011. Neomphalina. Accessed on March 3, 2017 through WoRMS at http://www.marinespecies.org/aphia.php?p=taxdetails&id=579262. Nakamura, K. et al. 2012. Discovery of new hydrothermal activity and chemosynthetic fauna on the Central Indian Ridge at 18–20 S. PLOS ONE 7(3): e32965. Link. The Digital Atlas of Ancient Life project is is managed by the Paleontological Research Institution, Ithaca, New York and is supported by the National Science Foundation. Any opinions, findings, and conclusions or recommendations expressed in this material are those of the author(s) and do not necessarily reflect the views of the National Science Foundation.